The global ideological shift and the economic crises that we have recently faced combined together have almost side lined the pertinent topic of climate change. Commitments made by various nations for the Paris Climate Agreement fall short. The world political scenario is dominated by governments who only believe in incremental goals. At the policy level, financial pressures usually take precedence over environmental concerns. However, what is not being realised is that planned and more futuristic investments can address both issues for a more cost and resource effective approach. The world needs to understand that we cannot afford to lose our last chance to minimise climate change. It is indeed a case of now or never. Climate change skepticism is growing and the greatest obstacle in dealing with it is the fact that people are unable to observe it as an individual problem but instead treat it only as a global phenomenon which is too big to solve at an individual level. Policy researches and climate change summits have been dismal at breaking the concept down to the commoners. A certain small section that is comparatively aware refrains from taking any notable action as the enormous magnitude and intractability intimidates them and they end up believing that whatever they do contributes too little to the cause. This is where behavior change communication comes into picture. The concept is to change how people perceive climate change and environmental issues in general. It should not become ‘one of the issues’, but rather a significant segment of all socio-economic and health problems. This linkage needs to be communicated in the most contextualised and comprehensible manner. It should be established at all levels that environment does not negate economic progress rather accelerates it making it more sustainable in the long run. Everett Rogers in his book – “Diffusion of Innovation” (1983) discusses various dimensions that influence the acceptability of the target group in adopting any innovation (in this case the concept of Climate Change). He discusses how chances of adoption becomes higher when the innovation is considered superior to the prevailing practice or is in harmony with the existing social norms. Rogers proposed a five-stage theory that synchronises with Development Alternatives’ 4A’s Approach (Assessment, Awareness, Action, and Advocacy). Rogers lays stress on the implementation cycle of a programme where gaining knowledge through assessing the topic and the target audience is of foremost significance. The second stage is of persuasion which can be achieved via massive awareness drives which in turn lead to a decision that manifests into an action and thus gets implemented. The last stage is of confirmation that we can do via advocacy. When people see their actions being replicated, they feel motivated. These motivated people in turn become role models for new adopters. Another theory that makes sense here is the theory of Nudging. Nudging is based on the concept that most sustainable behaviour trends are non-conscious and non-compulsive. It creates a zone where people behave in a more sustainable manner whilst still being provided with the freedom of choice. Studying and addressing Semantic and Syntactic communication barriers is another step while designing such a programme. Thus, a mix of all these theories form an integral part of climate change communication. Development Alternatives has been working on various projects and has innovated several creative tools of communication. One such project was ShubhKal, wherein a reality show was launched for the rural community in the climate sensitive region of Bundelkhand in Central India. ‘KaunBanegaShubhKal Leader’ saw people adopt environment friendly lifestyles. People who won the show became ‘ShubhKal Leaders’ who then continued to be change agents in their communities. They kept creating behaviour change by encouraging and inspiring people to adopt sustainable practices like rain water harvesting, organic farming, etc. These ‘ShubhKal Leaders’ were facilitated at various platforms which motivated them further in their work as change agents. 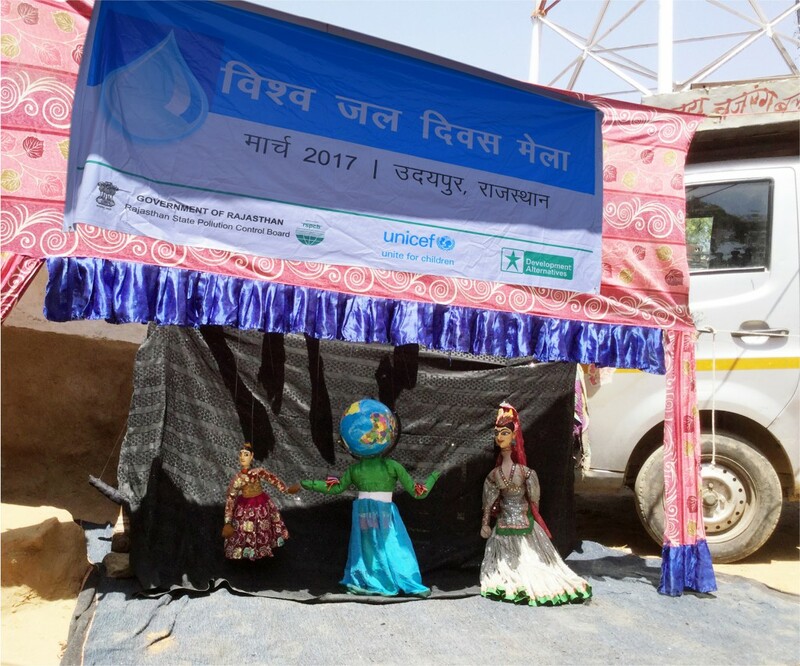 Development Alternatives along with UNICEF is doing a project in Rajasthan on building resilience among children, adolescents and caregivers to combat climate change. In this project, a new module for the KAP Survey is being designed where cognitive methods will be used to gather information and test the knowledge of the target community. It was found after a pre-test that children (aged between 8 to 14 years)found answering 50 objective and subjective questions tiresome and uninteresting. Children enjoyed the process more when the same questions were asked to them in the form of a game. They were shown pictures of polluted water bodies, pollution emitting cars and factories, deforested grasslands etc. The responses were recorded. This kind of baseline and tools can be used with even illiterate and introverted people. Other innovations such as creating a JalVayuRangmanchwhere puppetry performances are scripted and performed have also been implemented under this project. The narrative is based on climate change, the growing water shortage and whatcommunities can do to adapt and change to the circumstances. Earth and pollution are personified and the artists use puppetry,music and many other traditional media tools to spread the message. The dialect and messages are localized and global warming is linked to drought and flash floods which the people in this area of Rajasthan have been witness to over the last few years. Through the use of these innovative tools, the concept of climate change is being demystified for the common people. JalShobhYatras can be organised locally in an event format where an identified group of community members would go to the nearest natural resource like a water body or a forest. They would then hold discussions there which will work as focus group discussions (FDGs) on various factors that impact natural resources. Comic strips are a great method to document and evaluate personal stories. The advantage of this method is that even people who are illiterate and might be too shy to participate in FGDs, can get to share their knowledge and stories regarding the subject. The anthem approach is being developed as well to promote the message of creating a clean environment. The idea is to reach out to the target audience through every channel possible. The song should become an instant audio identity. To bring climate change into the mainstream community discourse, it is very important to localize the context based on theories and continue to build awareness of the issue in practical terms. Simultaneously, mapping the multi-dimensional layers of influence and providing a clear message on the direct and indirect impacts of behaviour is critical. It is also important to identify and break down barriers, allow future impact and measurement to be assessed, recognize individual readiness and identify stages of readiness that can be aligned to the right techniques of influence. What is most imperative is to engage with the younger audience as education at an early age is most effective in changing behaviour.